I. Professional Certificates (1. Internship Certificate 2. Project Completion Certificate & 3.InPlat Training Certificate) will be awarded at the end of the training program. 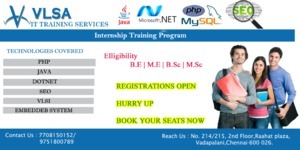 II.FREE placement training (Aptitude, GD, HR Interview) is also provided. III. Everyday a new batch is started so the students can come and join in any day in the month of May (or) June (or) July according to their convenience. IV.Our Company will be working on all 7 days of the week. (including Saturdays and Sundays).